always in fresh water, Beautifully maintained Black/White hull. ONLY 3 seasons in water. Excellent for entertaining friends or family, adults or children. Spacious walk thru layout allows guests to face each other with ample seating. Cockpit seating and table easily converts to large aft sundeck/lounge. Convenient cockpit wetbar with frig and icemaker for keeping cool. Corian countertops are beautiful and easy to maintain. 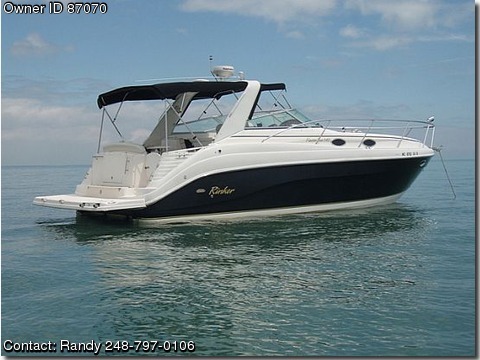 Kohler generator with Heat/AC allows full Great Lake Boating Season to be enjoyed April thru October.Excellent deep V hull design for great handling. Twin 350's cruise easily at 30 mph fully laden. 12 month AFTERMARKET WARRANTY.. Located in Beverly Hills Michigan.